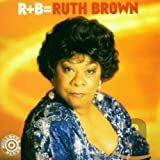 Ruth Alston Brown (née Weston, January 12, 1928 – November 17, 2006) was an American singer-songwriter and actress, sometimes known as the "Queen of R&B". She was noted for bringing a pop music style to R&B music in a series of hit songs for Atlantic Records in the 1950s, such as "So Long", "Teardrops from My Eyes" and "(Mama) He Treats Your Daughter Mean". For these contributions, Atlantic became known as "the house that Ruth built" (alluding to the popular nickname for the old Yankee Stadium). 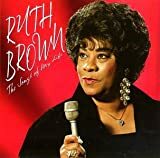 Following a resurgence that began in the mid-1970s and peaked in the 1980s, Brown used her influence to press for musicians' rights regarding royalties and contracts; these efforts led to the founding of the Rhythm and Blues Foundation. Her performances in the Broadway musical Black and Blue earned Brown a Tony Award, and the original cast recording won a Grammy Award.